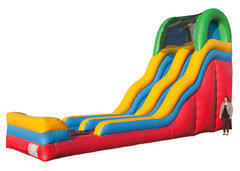 The Caterpillar is a Castle Wet-N-Dry Combo that offers a Fun Bouncing, Climbing, and Sliding Area. With a total size of 29 feet long, 11 feet wide, and 15 feet tall, this is no small inflatable and will make an excellent bounce house slide for your next party! 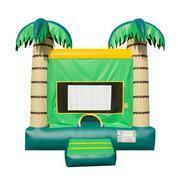 Create a tropical setting at any event with our Paradise bounce house. With its yellow, green and tan color theme, these Palm Trees are sure to stand out in everyone's eye. It is a compact ride, designed to fit into almost any yard. The 15'x15' Palm Tree bounce house is enough to safely accommodate many individuals. 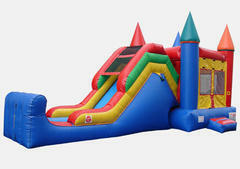 As a classic source of fun and physical activity, so be sure to have a Paradise bounce house for your next party! 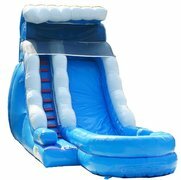 Air City Bounce adds to its collection of inflatable slides with the Surf Air a 19’ Single Lane Slide, a standout ride with an eye-catching color pattern. 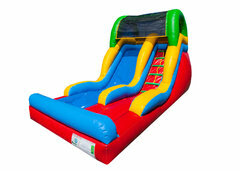 At 19 feet, it stands as a tall slide with a slide platform angled at 40 degrees for tons of sliding fun. The 19 Single Lane Slide allows riders to climb up and enjoy the slide without worry of safety. This slide is an upgrade in safety from other slides as it includes an inflated safety bumper at the end of the slide along with a netted top and high sidewalls. This slide can be used wet or dry and while it doesn’t look too tall form the ground, you wont be the first to climb to the top and chicken out! Take the fun into the sun with Air City Bounces Tropical Slide Combo. An attractively designed combination ride featuring a bounce house with a slide attached. 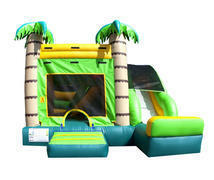 The Tropical Slide Combo consists of a 10'x10' bounce house with a basketball hoop and an 8 foot tall climb and slide. The jumping area is entirely enclosed with sturdy vinyl walls and a fine mesh net, to allow monitoring from outside. 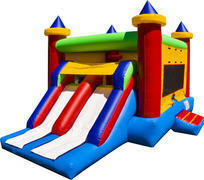 High inflatable walls guard the slide, a safety net to prevent jumping from the top and an inflatable bumper at the end! Come along and slide down this fantastic NEW ride! Slide, glide, slippity slide, everybody on your block is going to love this ride! Our Drifter is the newest addition to our slide family. The 6 foot tall slide platform is covered with a safety netting to prevent jumping and the slide is protected with high inflatable walls and bumpers. The Drifter can be used as a dry slide, but it won't be living up to it's name unless you add some water! It has a 6 inch deep splash zone at the end of the slide which makes for a fun exit. Air City Bounce introduces yet another series of combo rides These inflatables are a great alternative to simple bounce houses, and with the design of the traditional bounce house, the jumping castle combo slide is a sure bet. These rides combine a slide and bounce house to increase overall fun for all ages. 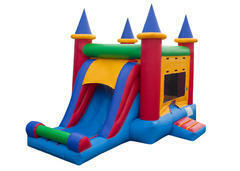 The 21’x13'x15' bounce house also includes a basketball hoop and spacious bouncing area. The slide is now taller than our past bounce houses and has safety features like a taller sidewall on the slide. This is one of our most popular combos. Brand new for 2018! The Skipper is an awesome bounce house slide pool combination. The slide platform stands 10 feet tall! Just fill the pool at the bottom of the slide and no more water is needed. You will slip so fast that those trying to catch you on camera might be there all day trying to do so.